A Kim-Trump meeting opens a window of opportunity for the international community to shift its hopes away from China taking “responsibility” for North Korea’s nuclear behavior and toward asking Washington to do its fair share. Under Trump, United States officials adopt an extreme position relative to American security research elites who for decades have argued that recent Chinese success was made in the United States. They argue that Washington aided China by letting it into the World Trade Organization and by using the U.S. Navy to keep the Indian and Pacific oceans open for shipping in and out of Chinese ports. In exchange, Washington exhibits a sense of moral high ground by expecting China to implement North Korea-related policies Washington decides alone or in consultation with Tokyo and/or Seoul. China was surprised when Trump made North Korea a key topic in his first meeting with President Xi in April 2017. Beijing has long argued that North Korea is a sovereign nation that pursues its own foreign and defense policies. When Trump called Xi a week later, again over North Korea, it was yet another affirmation of the end of Obama-era strategic patience with Pyongyang. But isn’t Trump’s impatience equally directed at Beijing? Is America’s Korea policy establishment ignorant about the limits of Chinese influence over North Korean behavior? Viewed from China, North Korea is NOT an area in which the Obama administration failed to act. After all, under Obama, the U.S. deployed to South Korea its military’s most powerful high altitude antimissile defense system (THAAD). THAAD was the single issue that managed to reverse the goodwill generated between Beijing and Seoul at the start of the Park Geun-hye administration in February 2013. Park was the only head of state from an OECD country to attend the September 2015 military parade in Beijing commemorating the 70th anniversary of the end of World War II. The United States successfully lobbied virtually all of its key allies to boycott the parade. 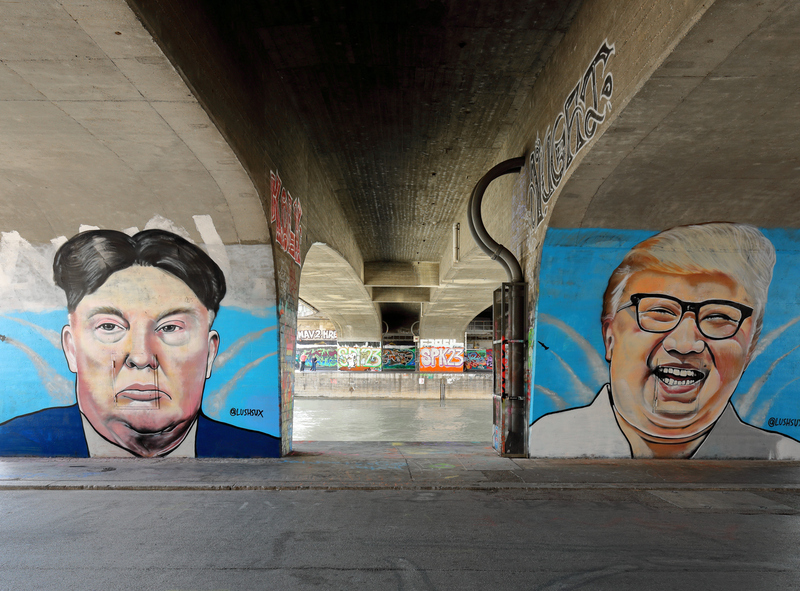 The Kim-Trump meet-up is difficult to forecast. A bit of history is useful. It’s often forgotten that when the U.S. reached an arrangement with Pyongyang in 1994 for North Korea to abandon its nuclear weapons program, China was not invited to participate, either in the diplomatic process or in the ensuing aid-for-freeze arrangement under the Korean Energy Development Organization (KEDO) program. The KEDO process stumbled for 10 years, both on the ground and in diplomatic terms. It was only after Pyongyang’s withdrawal from the Treaty on the Non-Proliferation of Nuclear Weapons in January 2003, marking the complete failure of all preceding efforts, that China was asked to be part of the multilateral effort to entice Pyongyang to change its behavior. A preferred outcome of the Kim-Trump meet-up would be a lessening of tensions that enabled average Westerners to travel to North Korea to see the society for themselves. First-hand knowledge could help counter-balance the portrayal—with a heavy dose of Western imagination and propaganda—of China’s influence over North Korea. The unanticipated announcement of a potential Kim-Trump summit has taken both of North Korea’s international enablers, China and Russia, by surprise. To what extent is Pyongyang coordinating its policies with China and Russia, with which in recent years it has become somewhat closer? If history is any guide, not much. In a broadly similar situation in 1972, when the North and the South engaged in secret diplomacy aimed at achieving normalization in Korea, Seoul kept Washington in the loop but Pyeongyang barely informed Beijing and the Soviets of their moves. North Korea’s strategy towards China and Russia can be summarized thus: expect their support in times of crisis but otherwise keep them at arm’s length and in the dark. The Chinese, in particular, have found themselves marginalized after South Korean President Moon stole Beijing’s thunder through his dogged effort to melt the ice with Pyongyang. At one level, the Chinese foreign policy establishment has nothing to complain about. Beijing has long advocated dialogue and reciprocal de-escalation in Korea. China has consistently insisted on Pyongyang’s denuclearization, and has recently ratcheted up sanctions against its ostensible ally. A breakthrough on the Korean peninsula is entirely in China’s interest. Who could decry peace, security, and stability? Beijing aspires to regional hegemony, seeing itself as a benign but indispensable power, and expecting deference from lesser players, including the two Koreas. This self-image, reinforced by the Western perception of China’s centrality in any resolution involving North Korea, does not necessarily have currency in Pyongyang, which has a long history of resenting its powerful neighbor. The North Korean leadership suspects that, should the right moment arrive, the Chinese would not be averse to meddle politically by replacing Kim Jong-un with a more pliable client. Relations have deteriorated in recent years, as the Chinese leadership (including Xi Jinping) grew frustrated with their difficult ally. This may explain why Kim Jong-un cut China out of the loop by reaching out to President Moon and, through him, to Donald Trump. The summit, if it happens at all, will require a most intricate balancing on China’s part. North Korea has long served as a tool of Chinese foreign policy. The broader game is the future of the Sino-American relationship, and, in particular, Washington’s and Beijing’s standing in East Asia. The crisis in Korea allowed the Chinese to maintain the high moral ground of a peacemaker. Even though China had been unwilling to exercise the full degree of its leverage on Pyongyang, it certainly valued being seen as the one power in a position to do so. This dynamic empowered Beijing vis-à-vis Washington and the regional players. Now, though, China’s centrality is in question. China is becoming a sideshow to the inter-Korean dialogue and the open-ended engagement between Pyongyang and Washington. Of course, the chances of success are very limited. If the summit fails to take place, we’ll be back to the more familiar strategic setting, with China again prominently at the center. For now, the Foreign Ministry will likely encourage engagement for the sake of lessening tensions, just as Zha Daojiong suggests. But Beijing will carefully watch the unfolding détente on the peninsula, looking after their own strategic interests. They definitely can’t count on Kim Jong-un looking after them on China’s behalf. It is far from clear that Kim Jong-un and Donald Trump will meet. As this point, the North Korean government has not confirmed a planned meeting. The South Korean government is the main go-between at this point. This summit is often compared to the 1972 Nixon trip to China, but that visit was announced after the U.S. national security advisor held secret talks in Beijing and both sides had been working towards a rapprochement over a number of years. Both sides simultaneously announced that Nixon had been invited and had accepted. During the six months between Kissinger’s trip and the actual Nixon visit, additional discussions were held to work out topics, timing, and other matters. Trump has just dismissed his secretary of state. The nominee for assistant secretary of state for East Asian and Pacific Affairs testified before the Senate in February but still hasn't been confirmed. There is no U.S. ambassador to South Korea, and the top diplomat focusing on North Korea has just stepped down. There are more than a few uncertainties about a May summit. What would actually be discussed by the two leaders? The White House has asserted that its aim remains denuclearization. That is unlikely to happen in the next few years. The North Korean regime sees itself in a hostile neighborhood with the world’s greatest military power as its main foe. There is little reason for North Koreans to give up the weapons they see as deterring attack. Kim knows, but must be consistently reminded that use of such weapons would immediately result in an overwhelming and regime-ending response. Further, North Korean leaders must understand that they cannot use the threat of nuclear attack to weaken the alliances the U.S. has with South Korea or Japan. Beyond this, the main task for the U.S. and others now is to work to ensure that North Korea does not transfer weapons technology to others. Any such effort to prevent nuclear weapons proliferation would require cooperation from China. China has good reason to support such an effort, but for a variety of reasons it has not always reined in banks and others who have facilitated North Korean evasion of United Nations sanctions. The U.S. government’s increasing pressure on Chinese institutions aiding North Korea may be successfully raising the costs of such action, leading more individuals, businesses, and supervising agencies to see compliance with the sanctions as the better bet. Chinese officials have long called on the U.S. and North Korea to speak directly to each other. North Korea has craved such direct talks. Getting the American president to agree to a possible summit is already a domestic public relations triumph for the North Korean regime. China may not necessarily welcome being excluded from such a meeting, but it certainly welcomes anything that ratchets down the regional tensions and the U.S.-South Korean and U.S.-Japanese defensive build-up that has resulted. And China’s leaders welcome anything that causes the Trump administration to stop expressing disappointment that China hasn’t successfully “handled” the problem of North Korea. The recent announcement that Trump agreed to meet DPRK leader Kim Jong-un demonstrates the fluidity and unpredictability that now characterizes the future of Northeast Asia’s security. Over the past year, the region has come closer to conflict than at any time since the 1952 ceasefire divided the peninsula. Today, the parties engaged in the effort to find a path to peace span the globe. No one power can decide how this story will end. While the United States and China blame each other, demanding that each take responsibility for exercising influence over their respective Korean allies, South Korea’s President Moon Jae-in has persuaded Kim Jong-un to come to the table. The Pyeongchong Olympics provided an opening for Korean dialogue, and for the creation at least temporarily of a shared Korean identity and quest for peace. South Korean officials have taken the lead in expressing the contours of a high-level U.S.-DPRK summit, visiting Pyongyang, then Washington, then Tokyo and Beijing, to urge support for a diplomatic solution over conflict. All of Northeast Asia was worried that the U.S. and North Korea were on a collision course. With rhetoric escalating and militaries on high alert and demonstrating their capabilities, a second Korean War was not unthinkable. Kim claimed his aim was nothing less than striking the American homeland with missiles and nuclear weapons. Trump threatened “little rocket man” in Pyongyang with “fire and fury.” National Security Advisor H.R. McMaster shocked Washington by saying a limited preventive war was an option, and Victor Cha, nominee for U.S. ambassador to Seoul, was dropped after saying such a war would kill hundreds of thousands of South Koreans (and potentially Japanese) and tens of thousands of Americans. Japanese Prime Minister Abe Shinzo ordered his military and Japanese citizens to contemplate a lethal missile strike on Japan. Both U.S. allies understood that North Korea was taunting the U.S. and seeking to demonstrate to its allies that the extended deterrence that they had taken for granted could be challenged. In Seoul, Tokyo, and Washington, experts wondered where to identify the red line that Pyongyang might cross to provoke Trump to use force. Few decry the striking announcement that Trump and Kim might meet to try their hand at finding a negotiated solution to the crisis. But skepticism runs high as to Kim’s motives. Few think the North Korean leader will give away his arsenal in exchange for U.S. promises of a peace treaty. Tokyo’s leaders are fully sensitive to their country’s vulnerability to a belligerent Pyongyang. Japan was targeted by North Korea in their accelerated missile testing of 2017, and many in Japan believe that is because of their defensive military posture. Expect Abe to lobby hard with Trump to avoid any perception that he is willing to cut a deal that will leave Japan with less U.S. protection. Expect too that by the end of 2018, when military planners will have identified their preferences for how to strengthen Japan’s defenses, Abe will be advocating for enhancing Japan’s offensive capabilities in order to deter Kim from miscalculating his country’s determination to defend itself. The military balance in Northeast Asia is shifting. Regardless of what promises Kim might offer in his meeting with Trump, few believe that negotiation alone can make the region safer. What will president Xi Jinping do when Donald Trump meets Kim Jong-un? Simple, prepare to meet the Pope. Perhaps it was in this environment of positive competition that the idea of the Trump-Kim summit came about. As recent Beijing-Vatican relations showed improvement, many started talking of the possibility of a summit between Xi and Pope Francis, possibly prompting publicity-hungry Trump to feel he had to outshine Xi and the Pope. Thus, the green-light for his meeting with Kim. In this case, peace begets peace and it doesn’t matter who outshines whom. The end result? The clouds of war will be blown a little farther off. After the summits, the problems of North Korea and China will remain, but, perhaps thanks also to the publicity, everybody will be more committed to solving them. China has long favored U.S.-North Korea direct talks; that’s why China promoted and hosted the Six Party Talks. Last year Pyongyang and Washington vociferously rejected China’s “freeze for freeze” proposal (a freeze in North Korean nuclear and missile tests in exchange for a freeze in U.S./South Korean military exercises), yet they have now effectively accepted it. Trump is grateful to Xi for, as he believes, helping to make this happen. Xi can relax: Korea is not Beijing's problem any more. Let the two sides talk. The sense of crisis—which the Chinese always thought was created by the Americans for such ulterior motives as tying Japan and South Korea closer to the U.S.—will diminish. North Korea will continue to possess (and secretly develop) nuclear weapons, but without provocations so long as talks continue. The United States will continue to impose sanctions, but they will become increasingly leaky. The risk of war on China’s doorstep is over. Life will go on the way it does in the real world, unsatisfactory but tolerable.